There are really only 3 options if you want an electric car; you can pay top dollar for an already converted vehicle, you can wait for the auto industry to get off their collective butts and wait for them to start producing an affordable electric car or you can build your own electric car. You may think that building your own electric car takes an enormous amount of esoteric car knowledge but, believe it or not, if you can handle basic car maintenance such as changing your oil then you can handle converting a gas guzzler into a nice, clean electric one. 1. Utilize the internet and your local library to learn everything you can about converting and building an electric car. 2. Find a mentor by joining the Electric Auto Association. 3. Find a cheap gas guzzler that you can convert. 4. Get a conversion kit. Trust me on this, it will make your life much easier. 5. You’re going to need machining tools for the conversion. So, unless you happen to be a machinist and you already have all the required tools then it would be a good idea to become good friends with someone who does. 6. You’re going to have to have the engine removed and you can usually find a local auto shop to do this for around $200. If you have your own engine lift then you can save yourself some money on this step. If you don’t then it’s best to let an auto shop handle this step. 7. It’s best to have a garage or some other dry and well lighted place to work in. Although you may plan for a quick conversion the best laid plans can easily go wrong. You don’t want to leave your car rusting while your waiting on a part. 8. If you purchase a complete conversion kit (like I mentioned in step 4) you can completely skip this step. But if you’re buying all the parts separately then you need to work out a delivery schedule. You don’t want to have a ton of parts cluttering up your workspace. 9. (Optional) Share the wealth of your hard earned knowledge. Participate in electric car discussion groups or better yet, start a blog to cover your project. You probably learned a great deal about converting your electric car online and a blog would allow you to pass on your mistakes, trials and triumphs for the next guy. 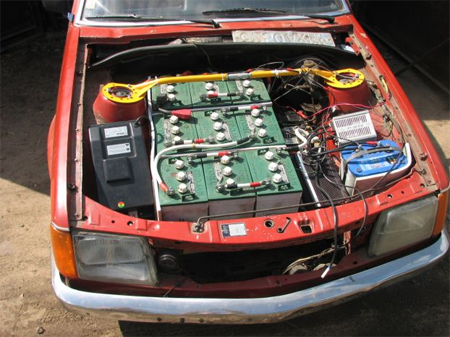 If you are a total newbie on Do It Yourself (DIY) electric car conversion project, it is best you read up on the science of homemade electric car. Check out the Electric Conversion Made Easy by Gavin Shoebridge. Gavin is from New Zealand and he is known as the Kiwi EV Guy. He has converted an old Mitsubishi Treadia into a pure electric car in his garage! Everything that he learned during the conversion process was documented in his ebook, from cheap and easy solution to solve a problem and even all the silly mistakes that he made. Click on the link below to see what Gavin’s manual has t offer. ==> Click here to visit Gavin’s web site now!